Newly appointed President Abdel Fattah Al-Sisi vowed to give up half his salary and half his wealth, in an effort to help Egypt with its austere economic situation and has called on his people to make similar comprises in order to tackle Egypt’s economic challenges. “I am going to do two things: I am not going to take half of this sum and my property, even what I inherited from my father, I will give up half for the sake of our country,” said President Sisi in a televised speech held during the commencement ceremony of graduating military students. Egypt’s economy has experienced a painful period over the last three years with the overthrow of two presidents, a deteriorating tourism and investment sector, rapid growth of unemployment rates and continued political instability. The Egyptian government will also have to face Egypt’s growing budget deficit, the aftermath of decades of corruption, and a costly subsidy system, in which a quarter of government spending goes towards food and fuel subsidies. Egypt’s fiscal year, which begins on July 1, is expected to bring in a 3.2 percent growth in Egypt’s economy, a number well below what is needed to combat Egypt’s painful economic challenges of widespread poverty and a rapidly growing population. During his speech, President Al-Sisi mentioned that he refused to approve the 2014-2015 state budget, which if ratified, would increase the total domestic debt from EGP1.7 trillion to EGP2 trillion. “We said we would revise this budget because I cannot bear to accept it when it contains this level of deficit,” the president said. 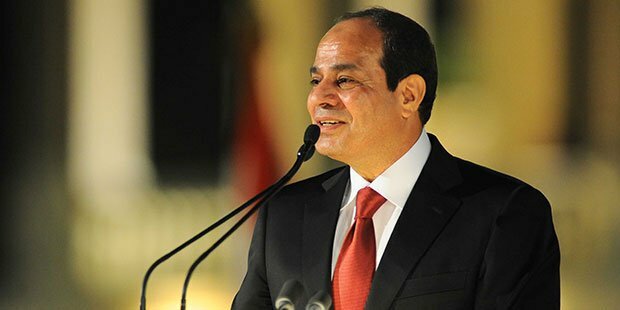 The President’s speech urged the public to be prepared for further measures to be taken to allow for effective reforms to Egypt’s suffering economy, such as subsidy reductions. Egypt’s last financial year, which ended in June of 2013, oversaw a budget deficit of 14 percent of economic output, and over the last two years, Egypt has been dependent on aid from its Gulf Arab allies. The aid, which amounts to USD20 billion worth of grants and loans according to President Al-Sisi’s presidential campaign, helped Egypt’s economy from plummeting, however, the president said that the country needs to take cost-cutting measures to overcome its economic austerity.